Our beloved Colle Val d'Elsa and its territory represent a strategic position to enjoy a wonderful Tuscan holiday, right in the area between Florence and Siena, the stunning cities rich in artistic and cultural masterpieces. Their surroundings (like Chianti) represent a world-class landscape excellence. But even in the past, the position was strategic: thanks to the abundance of water and the Francigena route, which from the Middle Ages carried pilgrims from Northern Europe to Rome, Val d'Elsa was an area of great commercial, political and also military interest for both Florence and Siena, who have historically disputed over the control of this area. Since the twelfth century, the Repubblica Fiorentina considered Val d'Elsa crucial and used its power to reach and overthrown the small landowners that ruled over the Francigena route to keep their influence on part of the first free indipendent towns of this area (and Colle Val d’Elsa amongst them). During the 15th century, excluding the large town loyal to Siena (Monteriggioni), Florence conquered San Gimignano and Poggibonsi reaching a vast dominion over the area using the vicaret of Certaldo to rule. The proud and fearless character of the Tuscan peoples has contributed to the creation of wonders recognized throughout the worldlike medieval fortresses and defensive walls or churches, but also to a continuous and heated rivalry among its various souls. The pride and political and civil passion of our villages is still present in the inhabitants of all the small or large towns and villages of Tuscany. During your stay in Bardeggiano we will help you discover and deepen our long and beautiful history. Even today the times of wars and knights, dames and intrigues of power, commerce and love are celebrated with spectacular reenactment shows and competitions. 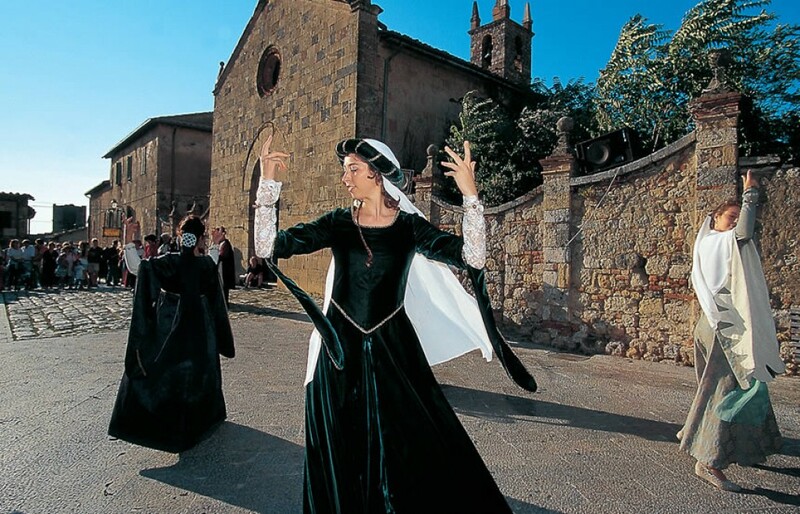 During the summer there are festivals and shows of the medieval character such as in the beautiful Monteriggioni or the incredible Palio di Siena, check these websites for more information. We are looking forward to welcome you in our beloved land.